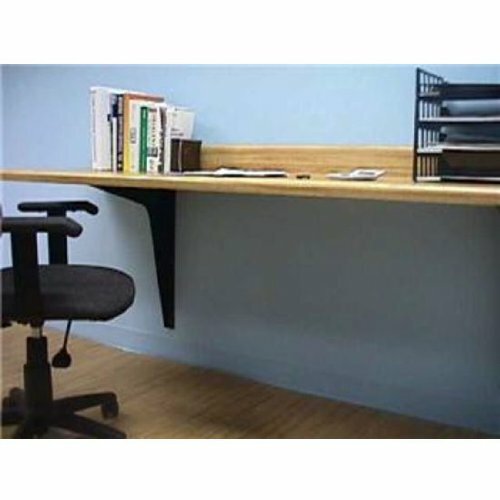 Best Brackets 24 inch D x 29 inch H Work Station and Counter Top Support Brackets are the ideal solution for large-scale counter top. A 1/8" steel construction with a weight load limit exceeding 1,000 lbs means strength and durability for any project. Multiple 1/4" mounting holes, mounting hardware not included, offer many installation possibilities, and the rugged reversible design supports even the largest and heaviest sized work or counter tops. A 3" x 3" 45° notch allows for wall cleats and helps conceal unsightly wire and cable runs. Available in full box quantities only, these brackets come in boxes of 4, with equal quantities of right and left brackets. The brackets are available in Black, White, Gray and Almond powder-coated finishes, and a pre-primed ready-to-paint finish. If you have any questions about this product by Best Brackets, contact us by completing and submitting the form below. If you are looking for a specif part number, please include it with your message.